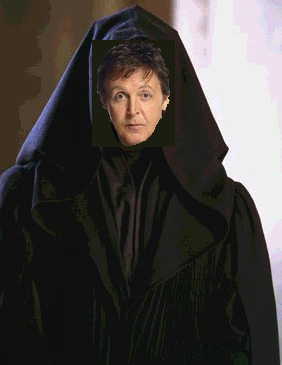 Darth Paul, as he appeared in Star Wars Episode XLVII: Let It Be. Darth Paul, a.k.a. Mac Hartney, is the tyrannical leader of the music division of fictitious Star Wars rock group "The Sith" He is the half-brother of Jedi warrior Rin-Go-Starr. Darth Paul released his controversial debut single, "Jey Hood", in Episode XLIV: Curse of the Smatijove, and despite galaxy-wide disapproval by music critics, Darth Raider was pleased with his work, and his single mysteriously shot straight to number 1 for seventeen weeks. Thus, he was recruited onto the Sith, where he swiftly exceeded thrugh the ranks and became the first Sith member to be award the fabled Platinum Vinyl. Darth Paul then went on to win popular talent contest "The X-Wing Factor", but there had been rumours of a fix which led to an investigation. When it was proven, Darth Paul was forced to face-off in a rematch, which he lost to his arch enemy, the Jedi Rin-Go-Starr. However, Paul has since gone on to take over this contest and its rules. From this point on, Darth Paul has since gone on to dominate the music industry and hold the Media world, situated next to his home planet Liverpool, to ransom. He recently launched his giant spaceship, the Death Guitar, in preparation for his latest battle in Fantastik 4 in which he hopes to destroy his brother Rin-Go once and for all. 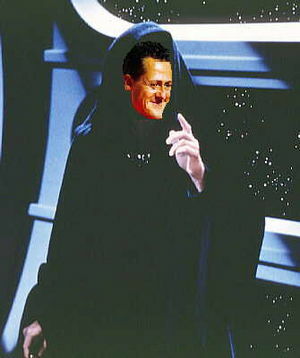 The overlord Darth Schumacher, conqueror of races. Darth Later - Still hasn't woken up. Darth Mall - Had a shopping centre named in his honour. Darth Thidioth - Relative of Sheriff John Bunnell. Darth The Rock - Notorious for his immensely strong eyebrows. Darth Paul has had a worldwide following of a staggering 4 people. Situated in the United States Of Kingdom, this club have nicknamed themselves "The Beatles", due to all four members suffering from a rare genetic disease which causes their haircut to form a smooth, black beetle shape. Two of the members have officially changed their names to "Paul McCartney" and "Ringo Starr" to match their Star Wars counterparts. They have tried making music themselves, but have failed to make any dent in the music industry, achieving only 20 number one hits in the USA and a miserable 17 in their home country. As a result, their other two members, John Lenin and George Harris, have since disbanded, and the remaining members limp on as a duo. Near the turn of the clock hand, a great warrior arose, one who nearly had enough willpower to defeat Paul. This Hero, known as Hethar Mil-Macar rose and with her lawyers help, removed his money. Thus nearly defeating him, though at the last minute, he received an anonymous donation, destroyed Mil-Macar, and restored his wealth with a new album. "Help! I need somebody! Help! Not just anybody!" "I look at all the lonely people..."
"You say stop, and I say go go go!" "I said something wrong, now I long for yesterday."